By Allan Fox: Deontay Wilder would be open to a fight against former heavyweight champion Wladimir Klitschko, as long as the Ukrainian takes a tune-up or two and looks good, according to Wilder’s trainer/manager Jay Deas. If the 42-year-old Wladimir decides he wants to make a comeback and fight WBC heavyweight champion Wilder (40-0-1, 39 KOs), they would be willing to give him a title shot if he takes a tune-up. Deas said Wladimir probably wishes he’d take a warm-up fight before challenging IBF champion Anthony Joshua for his title two years ago in 2017. At the time, Klitschko (64-5, 53 KOs) was coming off of a loss to Tyson Fury and a two-year layoff. Not surprisingly, Klitschko lost the fight after giving Joshua a lot of problems early on. Before Wilder can start thinking about a fight against Klitschko, he needs to make sure he gets passed his mandatory challenger Dominic Breazeale (20-1, 18 KOs) on May 18 on Showtime World Championship Boxing at the Barclays Center in Brooklyn, New York. There’s no point in Wilder thinking about taking a fight against the 6’6″ Klitschko if he loses to a motivated Breazeale. “Absolutely, Deontay Wilder wants the biggest fights,” Jay Deas said to Thaboxingvoice. “Remember, Deontay offered AJ $50 million and proved it was real. AJ and Eddie Hearn said it was real. They acknowledged it, and turned it down. They offered Deontay $15 million, and Deontay said, ‘Yes,’ and AJ said, ‘No,’ after we said, ‘yes.’ Deontay went after [Luis] Ortiz when nobody went after Ortiz. Deontay went out and got the Fury fight after that. So, Deontay wants the biggest fights. So if [Wladimir] Klitschko is out there and wants to do it, then, yes, we’re going to do it. My guess is Klitschko will want a tune-up or two, and we’ll have to see how he looks. If he looks good in the tune-ups, and makes himself available…when Vitali [Klitschko] came back, his first fight was Sam Peter, and he hadn’t lost anything. Well, we have to see where he [Wladimir] is. I think that’s what he should have done the first time,” Deas said about Wladimir should taken a tune or two before coming off of a two year layoff to fight Anthony Joshua in 2017. “Have one before he fought AJ. I think he’d probably look back and say, ‘I’d like to have had one before that. We want the biggest fights as soon as they come available,” Deas said about Wilder. There’s probably a better chance of Wilder’s management being able to negotiate a fight against Wladimir Klitschko than there would in putting a fight together with Joshua, especially if he insists on giving Wilder a 60-40 purse split. Wilder’s co-manager Shelly Finkel used to work with Klitschko, so putting a fight together between them shouldn’t be nearly as much of a problem as it would in negotiating a deal with Matchroom Boxing promoter Eddie Hearn, who promotes Johshua. “You’re really going to want to see this fight, because there’s been a big focus by Deontay in going back to the basics, and I think you’re going to see a lot of things that are going to be very impressive,” said trainer/manager Jay Deas. “Deontay is a great boxer. Deontay is setting things up a lot of times, it may be your thinking short terms, and we’re thinking in long terms. Sometimes you’re not winning rounds, but you’re doing things that will allow you to be successful later in the fight,” Deas said. Wilder’s unorthodox style of fighting has gotten him this far in his career. It might not help him to tinker with success. Of course, Wilder would have been better off if he’s thrown more jabs and straight shots in his last fight against Tyson Fury last December. Wilder was missing with a loot of haymaker punches thrown from long distance. It wasn’t until he threw a straight shot down the pike that he was able to knock Fury senseless in the 12th round. If not for some boxing fans believe to be a long count given by referee Jack Reiss, Fury would have been knocked out. Wilder needs some work in keeping him from throwing a lot of haymakers, because he tends to miss with those shots often. 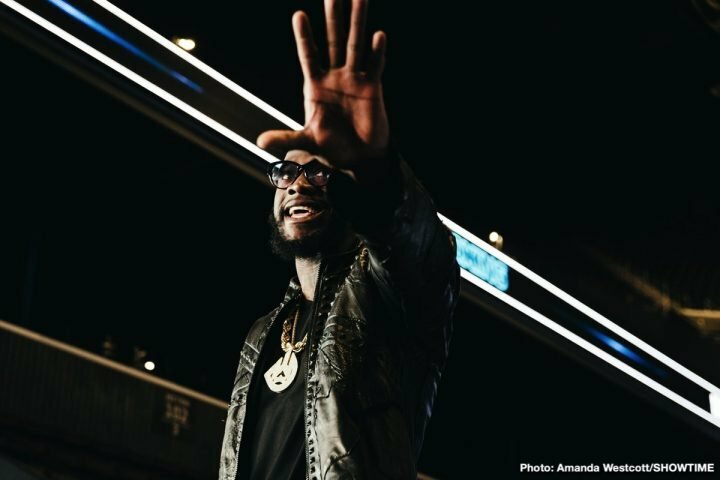 Wilder hasn’t had an injury since suffering a broken hand in his fight against Bermane Stiverne four years ago. It took a while before Wilder got conformable using that hand again. Wilder hits so hard with his right hand, it’s obviously not easy for him to avoid injuries. With Wilder’s huge 6’7″ frame, he gets a lot of leverage on his shots to deliver crushing shots. When you hit that hard, your hand can have problems. It’s not just Wilder’s opponents that feel the destructive force of his shots. His hands feel it too. “It’s about looking a the numbers and seeing where they stand,” Deas said about the Wilder vs. Joshua negotiations. “Deontay is with the biggest audience. He is the one that will be must see TV. Look at all their last fights. Who is the most exciting and has the biggest name, and who’s the one that brings a lot of people to the table? Deontay Wilder. So I wouldn’t want him to take less. There’s enough money for everybody in a fight of this magnitude. So I don’t see that should be a problem for Deontay to get if not 50-50, then the upside,” Deas said. Wilder deserves a 50-50 split of the purse for the fight with Joshua, according to Deas. A lot of boxing fans believe that as well. Since Joshua really wants the fight with Wilder, he might have to make an exception for the first time in his career in giving him 50% of the revenue. Joshua may never have to do it again, so it won’t be the end of the world if he gives Wilder parity in the negotiations. If Joshua wins the fight, then he won’t need to worry about Wilder asking for 50-50 again. “They certainly back their guy, but America is a lot bigger than the UK,” Deas said in pointing out that Wilder deserves a 50-50 purse split for the Joshua fight. “So there’s numbers over here. I knows when Deontay goes to England, he’s going to pack it. He’s must see TV over there as well. Let’s see if AJ does that over here. Let’s see what happens with the numbers in the States [for the Joshua vs. Jarrell ‘Big Baby’ Miller fight],” Deas said. The way that Deas is talking, Wilder likely won’t back down from his purse request of a 50-50 deal. That’s what he wants, and if he doesn’t get it, then there probably won’t be a fight between them. “We wanted the rematch immediately with [Tyson] Fury, but they [Top Rank Boxing] were the ones that said they didn’t want that,” Deas said. “That’s documented as well. So I think everybody understands Deontay wants the biggest fights. He had to do what’s best for his career,” Deas said about Tyson Fury choosing to sign with Top Rank and not take the rematch with Wilder. “They probably threw a lot of money at him and said, ‘You can fight who you want in the first fight or two.’ So his thought process was, ‘Why should I fight someone dangerous like Deontay Wilder when I can fight some other guys and pickup a lot of money first, and then maybe revisit that later? '” Deas said. A rematch between Wilder and Fury is supposed to be taking place in early 2020, but that’ll depend largely on the plans Top Rank has for the British fighter. If they want to continue to slowly build him up by matching him against fighters that he can beat, then the rematch with Wilder will be delayed. If Top Rank isn’t careful, they wait too long, and Wilder will get beaten by someone. There’s little chance Fury will lose to the guys that Top Rank are matching hi with, because they’re likely going to be putting him in with sure thing opponents that he can beat without question, starting with his June 15 fight against Tom Schwarz on ESPN. Top Rank is receiving a lot of criticism from boxing fans, who feel that this is a poor match-up for Fury. The fans want to see Fury fighting better opposition than this. “Miller is big, strong guy,” Deas said about Joshua’s next opponent for June 1 in Jarrell ‘Big Baby’ Miller, who he’ll be fighting on DAZN at Madison Square Garden in New York. “He doesn’t have what you’d call one-punch knockout power, but he’s very persistent. This is going to be a put up for shut-up fight for Jarrell Miller. This is his moment in his hometown. Everything is setup for him to be the best he can be. It’s up to him to do that. This is Jarrell Miller’s moment as well. Can he walk the walk like Deontay Wilder did [against Bermane Stiverne in their first fight in 2015]. He’s been here. He’s a good fighter. I think it’s going to be a good fight. Can he impose his will, and get some doubt coming into AJ’s mind? Obviously, AJ is the favorite for a reason. I think it’s going to be interesting, but we’re going to see if Jarrell can back up all the talk. This is his moment to do that,” Deas said.